The AudioBox 22VSL introduces a new generation of PreSonus USB 2.0 audio/MIDI interfaces that take hardware/software integration to the logical next step. Using your computer CPU and PreSonus Virtual StudioLive (VSL) software, the AudioBox 22VSL interface provides a 4x2 mixer, reverb and delay effects, and the same Fat Channel compression, limiting, semi-parametric EQ, and high-pass filter, as the PreSonus StudioLive™ 16.0.2 digital mixer— all with inaudible latency. Now you can monitor and record with or without real-time effects. 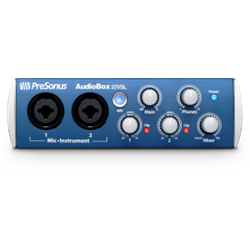 To top it off, while the classic PreSonus AudioBox USB is a fine-sounding unit, the new AudioBox VSL series sounds even better, with 24-bit, 96 kHz recording and top-of-the-line PreSonus XMAX™ preamps. We’ll have more to say about the preamps shortly. What’s so great about effects and processing on monitors? Tracking without hearing effects and signal processing is like playing a video game with your eyes closed. Musicians rely on aural cues when performing, and their performance can vary depending on what they hear in their monitors. Adding just the right amount of compression, EQ, and reverb can make a huge difference in their ability to hear themselves clearly and to experience their performance as if it occurred in a natural space rather than in the artificial sonic environment of the studio. The result is a better performance and ultimately a better recording. You have plenty of effects plug-ins for your DAW, but processing audio with a DAW takes more time than you might think. True, we’re talking milliseconds, but it’s long enough that if you put DAW effects in your monitors, you’ll either hear the original sound slightly before the processed signal, or play a note on your instrument and have to wait a moment to hear the result of your action. Both of which are very disorienting. If you like what you hear, you can record with AudioBox VSL-series Fat Channel processing, too! These are the same high-quality StudioLive 16.0.2 Fat Channel dynamics processors and EQs that professional musicians, engineers, and producers record with every day. The time-based effects are for monitoring only and can’t be recorded. Of course, most people add reverb and delay effects during editing and mixdown, rather than while tracking, in order to ensure that the effects on all tracks work together. We didn’t invent the first audio interface with effects. We simply did it better and for less money. Sure, some interface manufacturers that don’t normally make signal processors have added a compressor, EQ and a few effects to their interfaces. But the AudioBox VSL series provides all that, plus a separate limiter, expander, and high-pass filter—and we’ve been making high-quality signal processors since 1995. The AudioBox VSL-series’ Virtual StudioLive (VSL)-based effects and Fat Channel processing have been extensively field-tested and proven popular by tens of thousands of StudioLive™-series mixer users, including many top professionals. Of great importance, thanks to VSL’s browser, with its drag-and-drop convenience, adding processing and creating and loading presets is easy. Pro-level processing and superior ease of use mean you’ll get better results and have more fun! Bus-powered, compact, and rugged, the AudioBox 22VSL offers two convenient front-panel mic/instrument combo inputs with global phantom power and provides two line-level outputs. It sports the same high-headroom Class A XMAX™ preamps as the StudioLive mixers and has 24-bit, 96 kHz converters with 114 dB dynamic range for clear, clean audio. When we tell you we made the AudioBox 22VSL “rugged,” we’re not fooling! It employs a heavy-duty steel case that is just as robust as that of the original AudioBox USB. This mighty mite fits in just a third of a rackspace and can be screw-mounted to a standard rack tray (not included). VSL enables you to easily manage the processing and mixing from your Mac® or Windows® PC and provides editor/librarian functions, making it simple to create and use a library of presets. To get you started, we’ve included the same library of more than 50 Fat Channel presets that comes with StudioLive mixers. These presets were created by professional musicians and engineers and let you instantly set up dynamics processing and EQ for vocals, guitar, and much more. Seamlessly integrated with the included Studio One® Artist DAW and VSL, the AudioBox 22VSL interface works with virtually all Mac and Windows audio-recording software. And unlike most things nowadays, it’s very easy on your budget. So get the next-generation USB 2.0 interface that gives you real-time, low-latency effects; rock-solid construction; and high-end audio for low-end prices: AudioBox 22VSL!